It is widely known that Spanish missionaries played a significant role in introducing Catholicism to the peoples of the Andes throughout the colonial period. 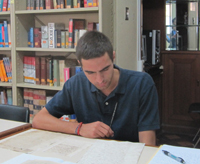 Notre Dame senior history major Joseph VanderZee traveled to archives in Lima and Rome to dig a little deeper and find out what these early missionaries thought of the indigenous population—and how their attitudes affected the development of the Peruvian Church. During his research, he discovered an understudied surviving section of Jesuit Diego Francisco Altamirano’s sweeping Historia de la Provincia del Perú, the original manuscript of which was destroyed in a 20th century library fire. It became the centerpiece of VanderZee’s senior thesis. 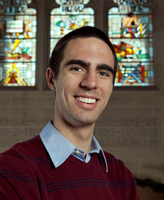 “Altamirano’s anecdotes of miracles, demons, and biblical allusions give his history its own distinct coloring, while revealing ideologies that underlined his Church’s and society’s work,” says VanderZee, who was invited to present his findings at the Final Colloquium of the Glynn Family Honors Program in late April, as well as at the University’s Undergraduate Scholars Conference in May. A rigorous course of study blending the humanities and sciences, the Glynn program makes special seminars, field trips, and mentoring opportunities available to some of the most promising scholars of each incoming class at Notre Dame. Every Glynn scholar is then challenged to complete a senior thesis, and the program guarantees students at least one summer’s worth of funding to conduct original research. VanderZee’s trip to Peru last summer was supported by the Undergraduate Research Opportunity Program in the College of Arts and Letters’ Institute for Scholarship in the Liberal Arts and a grant from the University’s Kellogg Institute for International Studies, where he was a part of the International Scholars Program. Funding from the University’s Nanovic Institute for European Studies allowed him to continue his senior thesis research in Rome this January. The primary documents VanderZee was able to access abroad were a vital part of his research, he says. Under the guidance of Rev. Theodore Hesburgh Professor of Arts and Letters Sabine MacCormack, VanderZee pored over every relevant document he could find, from accounting books to personal letters. “Constitutions for schools and seminaries, records of regulatory visits to missionary parishes, Jesuit administrative paperwork, and Altamirano’s detail-rich history have all served me as windows into the daily work of religious instruction and training for both Creole and indigenous Peruvians,” he says. More than simply a chance to conduct in-depth research on a topic he found intriguing, VanderZee says his senior thesis experience helped him develop valuable research skills in a global context. And those skills, he says, will continue to be an asset long after graduation. First, though, VanderZee says he plans to spend two years teaching high school social studies in Texas as part of the Alliance for Catholic Education’s Service Through Teaching program. Originally published by Alex Kilpatrick at al.nd.edu on May 14, 2012.